Every year, 3rd December marks the International Day of Persons with Disabilities (IDPWD). The theme for 2015 is “Inclusion Matters: Access and Empowerment for People of All Abilities”. 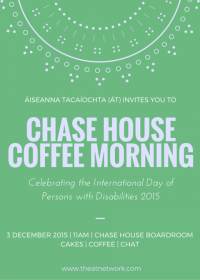 Here at Áiseanna Tacaíochta (ÁT), we celebrated the day by hosting a coffee morning with the staff of all the companies and organisations based in our building in Chase House; it was a great opportunity to raise disability awareness and discuss the importance of inclusion with the community around us. IDPWD got a lot of coverage across the media in Ireland and, here, we take a look at some of that; just click on the titles to find out more! Here, disability campaigner, Joanne O’Riordan, recalls how she questioned Taoiseach Enda Kenny on the inadequacy of disability services and supports in Ireland back in 2011, a moment which lead her on her own journey of activism. Joanne lives with total amelia, which means she was born without limbs; she was named as Outstanding Young Person of the Year by the Junior Chamber International (JCI) earlier this year. RTÉ News marked both National Accessibility Week and the IDPWD by highlighting accessibility issues and the importance of making buildings and public spaces open to everyone in society. They spoke to Sinéad Burke, who describes herself as a “little person”, and who asks people to think about how they would manage if they had to manage in a world designed for someone else. Cork-born disability rights campaigner, Julie O’Leary, lives with cerebral palsy. In this column, she discusses how employment, relationships and choice are basic human rights, and outlines some of the changes needed to ensure that people with disabilities enjoy them equally to everyone else. Here, Steve Daunt raises his concern that so many voices celebrating the day are coming from people who do have the lived experience of disability themselves. He feels that it’s important to have people with disabilities reminding others of the barriers that are still there.